The ASCII Stick FT is the arcade stick equivalent of the ASCII Pad FT. It was released only in Japan with fighting games in mind and is known to feature an optical joystick which is much more silent in operation compared to usual microswitch based joysticks (such as the Agetec joystick), as the contact clicking is absent. It also features a memory card dock. 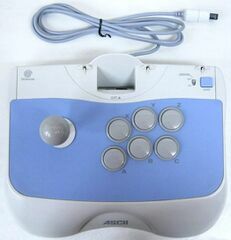 Like the ASCII Pad FT, different colours were released, including a black (Capcom) and blue (SNK) stick to celebrate Capcom vs. SNK: Millennium Fight 2000.